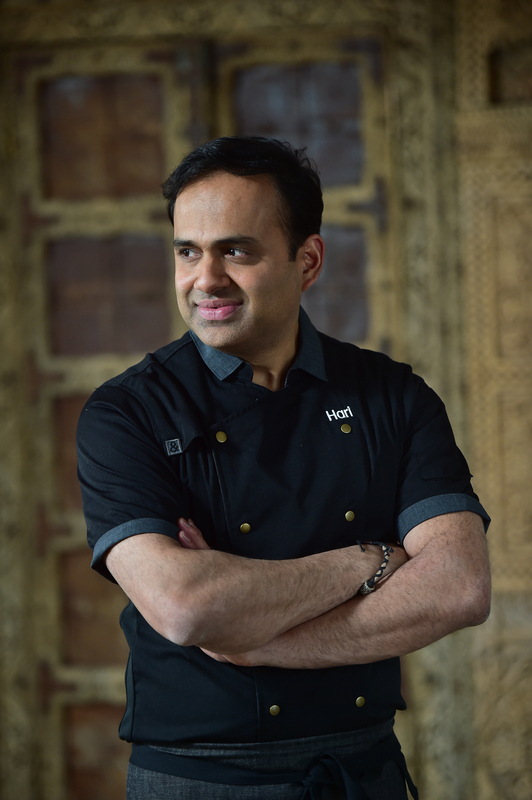 Chef, Restaurateur and Author Hari Nayak is known to use local ingredients and dish out some of the most enticingly flavoursome food. He is passionate about Indian cooking and endeavours to see it among the top three regional cuisines in the world. When I meet Chef Hari Nayak, one thing that strikes me about him is his simplicity. Well for being a chef, restaurateur, author and a culinary consultant he is still easy going and belies the feeling that I am talking to one of the most sought after chefs around the globe. 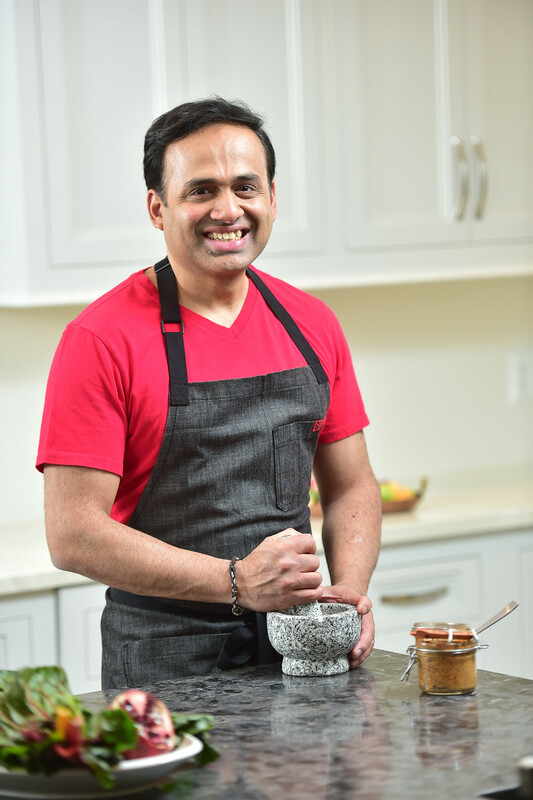 The New York based Indian chef is also the author of six cook books and his latest ‘Spice Trail’ has 100 modern global recipes for home cooks. His take on Indian food is what is being popularized through his restaurants in the Middle East, New Jersey, California and Tennesse. 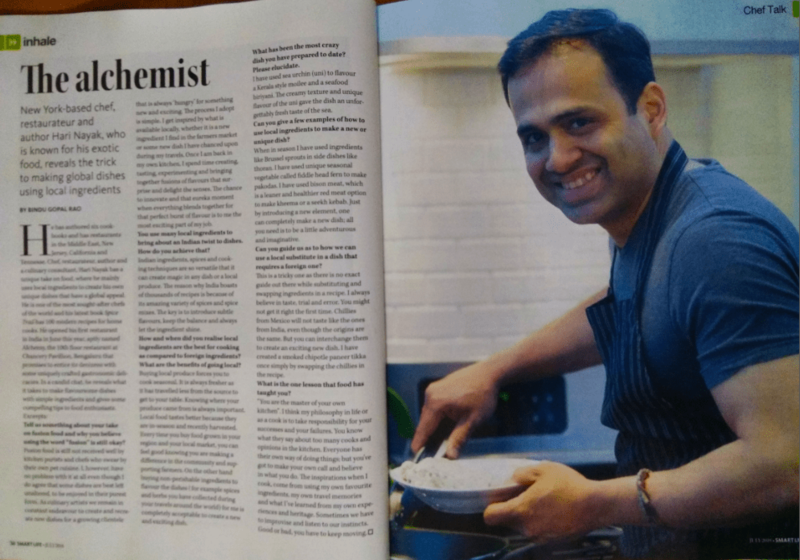 He opened his first restaurant in India in June this year, aptly named Alchemy, the 10th floor restaurant at Chancery Pavillion, Bengaluru that promises to entice its denizens with some uniquely crafted gastronomic delicacies. Tell us something about your take on fusion food and why you believe using the work “fusion” is still okay? Fusion food is still not received well by kitchen purists and chefs who swear by their own pet cuisine. I, however, have no problem with it at all even though I do agree that some dishes are best left unaltered, to be enjoyed in their purest form. As culinary artists we remain in constant endeavor to create and recreate new dishes for a growing clientele that is always ‘hungry’ for something new and exciting. The process I adopt is simple. I get inspired by what is available locally, whether it is a new ingredient I find in the farmers market or some new dish I have chanced upon during my travels. Once I am back in my own kitchen, I spend time creating, tasting, experimenting and bringing together fusions of flavours that surprise and delight the senses. The chance to innovate and that eureka moment when everything blends together for that perfect burst of flavor is to me the most exciting part of my job. You emphasize on using local ingredients. How do you ensure that local ingredients can be used to ensure that an Indian twist is brought about in the dish? Indian ingredients, spices and cooking techniques are so versatile that it can create magic to any dish or a local produce. The reason why India boasts of thousands of recipes is because of its amazing variety of spices and spice mixes. 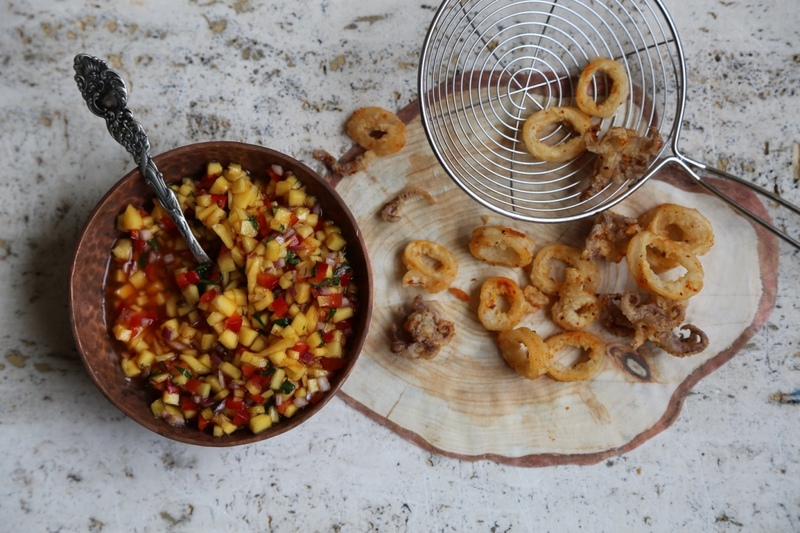 The key is to introduce subtle flavors, keep the balance and always let the ingredient shine. How and when did you realize local ingredients are the best for cooking as compared to foreign ingredients? Buying local produce forces you to cook seasonal. It is always fresher as it has travelled less from the source to get to your table. Knowing where your produce came from is always important. On the other hand buying nonperishable ingredients to flavour the dishes (for example spices and herbs you have collected during your travels around the world) for me is completely acceptable to create a new and exciting dish. What has been the most-crazy dish you have prepared to date? Please elucidate. I have used sea urchin (uni) to flavor a Kerala style moilee and a seafood biriyani. The creamy texture and unique flavor of the uni gave the dish an unforgettably fresh taste of the sea. Can you give a few examples of how to use local ingredients to make a new or unique dish? When in season I have used ingredients like Brussel sprouts to side dishes like thoran. I have used unique seasonal vegetable called fiddle head fern to make pakodas. I have used bison meat , which is leaner and healthier red meat option to make kheema or a seekh kebab. Just by introducing a new element, one can completely make a new dish; all you need is to be a little adventurous and imaginative. What are the benefits of using local ingredients, rather than foreign ones, even when the foreign ones are available? Local foods taste better because they are in-season, recently harvested and didn’t have to travel far to get to our plates. Every time you buy food grown in your region and your local market, you can feel good knowing you are making a difference in the community and supporting farmers. Can you guide us as to how we can use a local substitute in a dish where the actual one is unavailable? Also how to innovate using local ingredients? 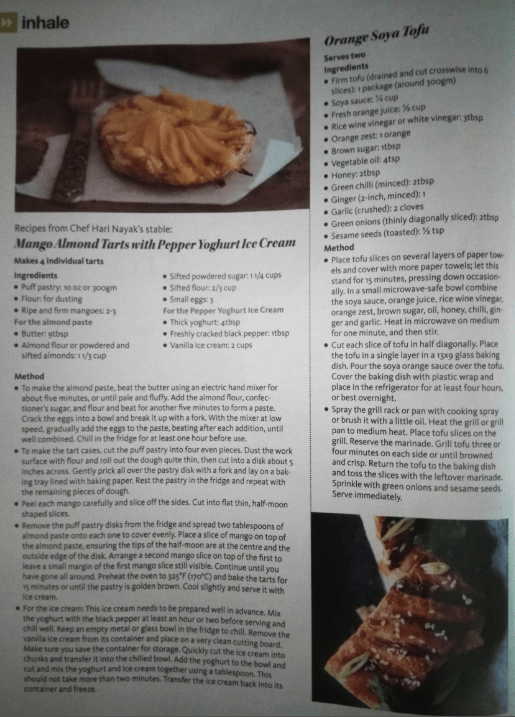 This is a tricky one as there is no exact guide out there while substituting and swapping ingredients in a recipe. I always believe in taste, trial and error. You might not get it right the first time. Chilies from Mexico will not taste like the ones from India, even though the origins are the same. But you can interchange them to create an exciting new dish. I have created a smoked chipotle paneer tikka once simply by swapping the chilies in the recipe. What is the one lesson that food has taught you? “You are the master of your own kitchen”. I think my philosophy in life or as a cook is to take responsibility for your successes and your failures. You know what they say about too many cooks and opinions in the kitchen. Everyone has their own way they like to do things; but you’ve got to make your own call and believe in what you do. The inspirations when I cook, comes from using my own favorite ingredients, my own travel memories and what I’ve learned from my own experiences and heritage. Sometimes we have to improvise and listen to your instincts. Good or bad, you have to keep moving. To make the almond paste, beat the butter using an electric hand mixer for about 5 minutes, or until pale and fluffy. Add the almond flour, confectioner’s sugar, and flour and beat for another 5 minutes to form a paste. Crack the eggs into a bowl and break it up with a fork. With the mixer at low speed, gradually add the eggs to the paste, beating after each addition, until well combined. Chill in the fridge for at least 1 hour before use. To make the tart cases, cut the puff pastry into 4 even pieces. Dust the work surface with flour and roll out the dough quite thin, then cut into a disk about 5 inches across. Gently prick all over the pastry disk with a fork and lay on a baking sheet lined with baking paper. Rest the pastry in the fridge and repeat with the remaining pieces of dough. Peel each mango carefully and slice off the sides. Cut into flat thin, half-moon shaped slices. Remove the puff pastry disks from the fridge and spread 2 tablespoons of almond paste onto each one to cover evenly. 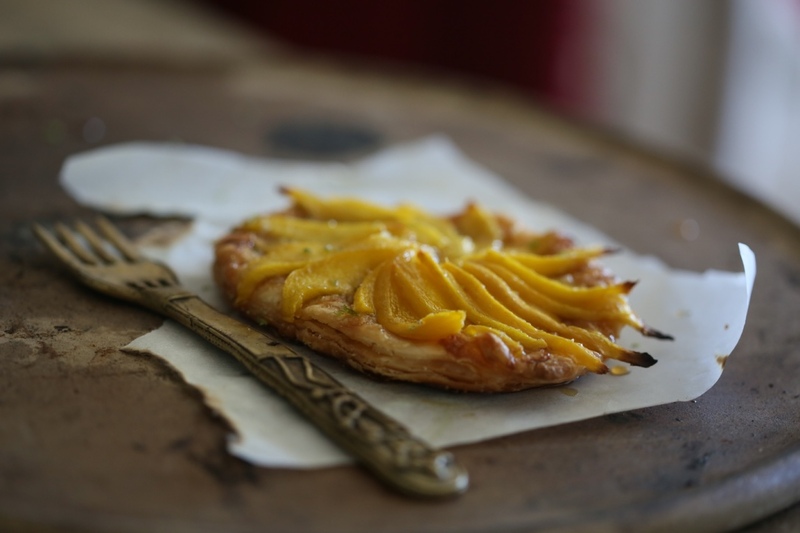 Place a slice of mango on top of the almond paste, ensuring the tips of the half-moon are at the center and the outside edge of the disk. Arrange a second mango slice on top of the first to leave a small margin of the first mango slice still visible. Continue until you have gone all around. Preheat the oven to 325°F (170°C) and bake the tarts for 15 minutes or until the pastry is golden brown. Cool slightly and serve it with ice cream. For the Ice cream – This ice cream needs to be prepared well in advance. Mix the yoghurt with the black pepper at least an hour or two before serving and chill well. Keep an empty metal or glass bowl in the fridge to chill. Remove the vanilla ice cream from its container and place on a very clean cutting board. Make sure you save the container for storage. Quickly cut the ice cream into chunks and transfer it into the chilled bowl. Add the yoghurt to the bowl and cut and mix the yoghurt and ice cream together using a tablespoon. This should not take more than 2 minutes. Transfer the ice cream back into its container and freeze. Place tofu slices on several layers of paper towels and cover with more paper towels; let this stand for 15 minutes, pressing down occasionally. In a small microwave-safe bowl combine the soya sauce, orange juice, rice wine vinegar, orange zest, brown sugar, oil, honey, chilli, ginger and garlic. Heat in microwave on medium for 1 minute, and then stir. Cut each slice of tofu in half diagonally. Place the tofu in a single layer in a 13×9 glass baking dish. Pour the soya orange sauce over the tofu. Cover the baking dish with plastic wrap and place in the refrigerator for at least 4 hours, or best overnight. Spray the grill rack or pan with cooking spray or brush it with a little oil. Heat the grill or grill pan to medium heat. Place tofu slices on the grill. Reserve the marinade. Grill tofu 3 or 4 minutes on each side or until browned and crisp. Return the tofu to the baking dish and toss the slices with the leftover marinade. Sprinkle with green onions and sesame seeds. Serve immediately.